Home » Opaque vs. Translucent – What’s the Difference? If you can see through something, is it opaque, translucent, or transparent? Two of these words might fit, depending on how clearly you can see through the object, but the other word is definitely not accurate. All three of these adjectives describe the amount of light that can pass through something: all light, some light, or no light. Continue reading to find out the difference. 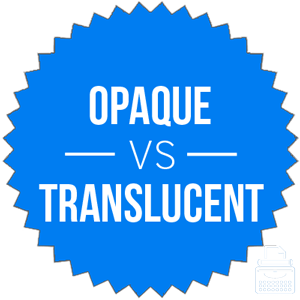 What is the Difference Between Opaque and Translucent? In this post, I will compare translucent vs. opaque. I will use each of these words in at least one example sentence, so you can see how they appear in context. Plus, I will show you a helpful memory tool that you can use to choose translucent or opaque correctly every time. What does opaque mean? Opaque is an adjective. Something that is opaque allows no light to pass through it. A rock is opaque. So is a brick wall, and so is a cow. The word opaque can also be used figuratively to describe something that is unclear or intentionally uninformative. An opaque press release, for example, may be designed to give away as little information as possible while still acknowledging an event that could potentially be seen as negative. The solar filter on a camera lens appears completely opaque, until one points the camera directly at the sun. The politician made an opaque statement to the press that raised more questions than it answered. Opaque dates back to the mid-17th century, and like many words, originally came to English from Latin. What does translucent mean? Translucent is another adjective related to light. Something that is translucent allows some light to pass through. A thin curtain might be translucent, since it allows some light to pass through while still filtering direct sunlight. Stained glass is also translucent, since some light can pass through it. Something that is transparent, meanwhile, allows all light to pass through. Most windows are completely transparent, and so is clean water and clean air. The jeweler polished the large amethyst until it became translucent. The bride’s veil was made of translucent fabric so that the groom could see her face through it. See also tranlucent vs. transparent. The choice between opaque vs. translucent is clear: when something allows no light to pass through, it is opaque. When something allows some light to pass through, it is translucent. If it allows all light to pass through, it is transparent. Since translucent and transparent objects both allow light to pass through, and both start with the root trans-, you can easily remember to use one of these words if light passes through an object. Is it opaque or translucent? Opaque and translucent are adjectives that deal with how much light passes through an object. If the object is opaque, no light passes through. If it is translucent, some (but not all) light passes through. The words are not interchangeable, so you must be careful to use each correctly. 1 What is the Difference Between Opaque and Translucent?